We all knew that this was coming for a while now. The original post was published back in February but I’m guessing most of you haven’t gotten around to making changes to your sites. Starting on April 21 Google will be rolling out changes to their algorithm globally, affecting mobile searches in all languages. 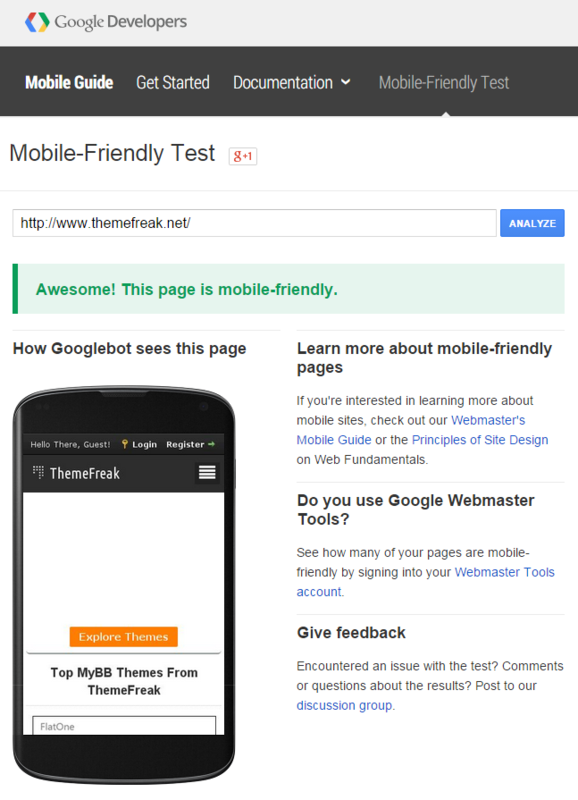 Lucky for you, Google has created a nifty tool that checks to see if your site is mobile-friendly in their eyes. The Mobile-Friendly checking tool is great but there have been negative reports of accuracy around the web. We tested ThemeFreak and as you can see below, there was an issue with the testing tool fetching one of our CSS files. If you’re wondering why your responsive design is not looking as you would expect, make sure that you’re not blocking Google via robots.txt file. For years now, mobile usability has been a factor in Google ranking algorithms. Sites that are mobile friendly rank higher than their counterparts in mobile searches and even desktop searches as well. If you haven’t already, now is the time to make your site mobile-friendly before you get penalized in the SERPs.